In today’s corporate world, we rely a lot on emails as a form of communication. Emails are a good way of communicating something that has to be written out in detail and more importantly, to record conversations so there is a “paper trail”. However, business emails require a lot more professionalism than informal emails to friends and family. Here are 10 additional tips on Email Etiquette that will not only help you write professional emails but also give the reader a good impression. 1. Use a clear subject line. More often than not, people will open an email based on the subject line. If there is a change in the meeting venue, a subject line such as: “Change in meeting venue for today”, is likely to draw immediate attention of the reader. If the subject line for the same situation were to read: “Update”, the reader may not necessarily open the email on a priority. 2. Always respond to any email with an acknowledgement even if it isn’t asked for. This shows alertness and a high level of professionalism. If you are unable to reply within a reasonable period of time, this is especially important. Let the sender know you have received their email and that you will get back to them by a specific day. 3. Ensure that you use the CC (Carbon Copy) and BCC (Blind Carbon Copy) features correctly. CC is for people whose identity can be shared with the recipients and those whom you do not expect a reply from but who still need to be in the loop. For example, if you are responding to a client complaint, it’s always best to CC your boss so that client knows that the issue has been escalated. For security and privacy reasons, it is always recommended to use BCC when sending mass emails. For example, your company is sending out a marketing announcement. Do not put your entire client list in the To or CC field. Not only does this violate their privacy, it exposes to others who your clients are and you put them at a risk of being contacted by people they may not know. 4. Make sure you are clear in your message. As this is not a phone or face-to-face conversation, what you say can be misinterpreted which can lead to confusion. Being clear from the get go will save you a lot of time having to clarify your points in more back and forth communications. If the email is lengthy, separate your thoughts by using bullet points or paragraphs. 5. Consider who your audience is before settling on the tone of your email. Different tones and levels of formality have to be used for different situations. For example, sending an internal email to the entire company versus sending an email to your team, or sending an email to a C-Suite Executive versus sending an email to a supplier. 6. Refrain from sending emotionally charged emails. You may be having a bad day, you might be frustrated by the person or the content of the email, or you may be in a rush to get somewhere, being polite in your response will often get you the best result. 7. Maintain confidentiality and avoid sharing confidential information over email. If you are uncertain whether the information you have can be shared via email, pick up the phone and call the recipient. Information such as bank details, credit card details and any personal ID related information should not be shared through emails. If you need to share passwords, consider a system like Last Pass or an online tool like Drop Dead. 8. Don’t expect an instant response to your email. Most people are not waiting on the computer for your email, therefore, it is important to allow the sender time to reply to you. If you need information immediately, pick up the phone and make a call. 9. Check your Trash or Junk box regularly to see if you’re missing any important or urgent emails. Some email settings do not allow unrecognized email addresses come in to your inbox. While this is protecting you, it could also mean that a new connection or client who has reached out via email has been filtered as spam or junk. Reset your email filters if need be, to allow any new connections you are expecting to email you. 10. If a sender has requested for a reply within a certain period of time, it is essential that you attempt to reply within that time period. If for any reason you cannot respond, follow point number 1 and acknowledge receipt of email and inform the sender when they can expect your response. 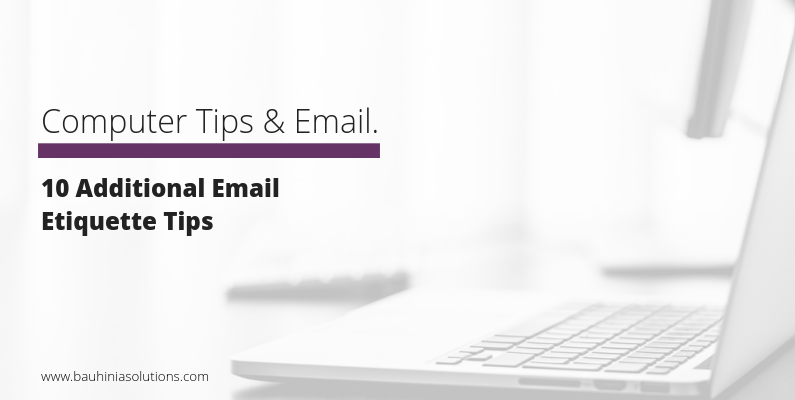 Interested in reading more tips on Email Etiquette? Check out our first article in the series.